A Baltimore police car destroyed by demonstrators sits in the street near the corner of Pennsylvania and North avenues during violent protests following the funeral of Freddie Gray in Baltimore April 27, 2015. 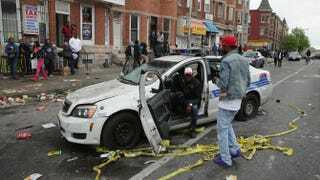 On Monday, soon after an emotional funeral for Freddie Gray—the 25-year-old man who died a week after being taken into police custody April 12—portions of Baltimore erupted into chaos as rioters clashed with police, threw objects at passing law-enforcement vehicles and looted local businesses. Baltimore Mayor Stephanie Rawlings-Blake issued a citywide curfew from 10 p.m. to 5 a.m., and Maryland Gov. Larry Hogan declared a state of emergency and called up the National Guard to help restore order. Images from earlier in the day showed a city under siege.